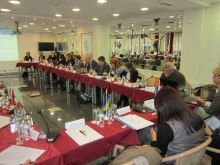 XXV DPPI SEE Regional Meeting was held on 13 - 14 November 2012 in Sarajevo, the seat of DPPI SEE Secretariat and was hosted/ organized by the DPPI SEE Secretariat in close cooperation with Bulgaria, the DPPI SEE Chair-in-Office 2012. The session included discussions on the DPPI SEE Disaster Management Training Programme (DMTP) 2013 and DPPI SEE Parties’ proposals on activities for inclusion in DMTP annual Work Plan 2013. The session resulted in 11 activities being proposed and adopted so far by the Steering Group, including a proposal on a joint DPPI SEE/ UNICEF workshop (12 in total). Further proposals will be integrated in the DMTP Work Plan draft by the end of the year 2012.